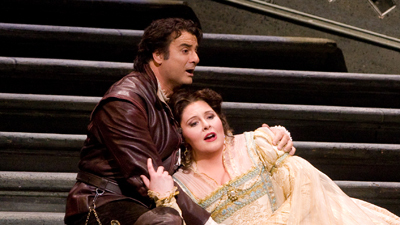 Pier Luigi Samaritani’s romantic production beautifully captures the sweep and passion of Verdi’s music. With James Levine’s marvelous conducting, this cast makes a spectacular case for Verdi’s opera. The great Luciano Pavarotti is at his stunning best in the title role as the wronged nobleman turned bandit. A beautiful and heartbreaking Leona Mitchell is Elvira, the woman he loves. But she is also pursued by two other men: King Don Carlo (Sherrill Milnes in one of his greatest roles) and her aged guardian, Don Ruy Gomez de Silva (a superb Ruggero Raimondi).